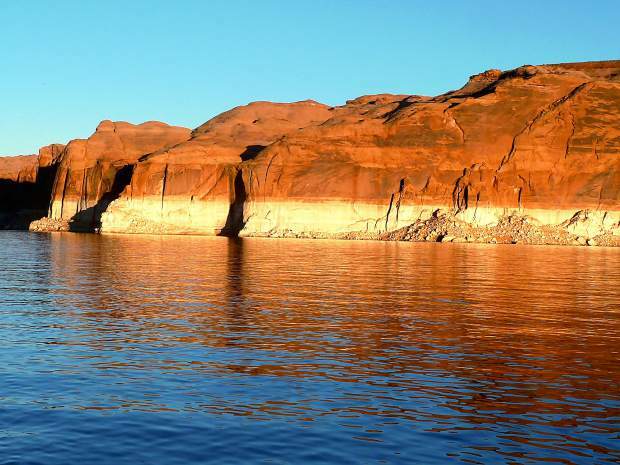 A key consideration for water managers in the West is how keep enough water in Lake Powell, above, and in Lake Mead, to allow the Colorado River water supply system to continue to function. Ranchers and farmers in western Colorado are incentivized to divert more water from the state’s streams and rivers than they need, an investigative reporter with ProPublica said at the Aspen Ideas Festival last week. Lustgarten, who has won national awards for his environmental reporting at ProPublica, spent time with ranchers and ranch managers in the Gunnison area as part of the two years of research he put in for his stories. Referring to Bill Ketterhagen, who runs a 750-acre ranch in the Ohio Creek valley, Lustgarten said “he and other ranchers tell me that if the law allowed them to use less water, without jeopardizing their legal rights to take it in the future, or if they could bank it — save it for a dry year — that they would. In “Killing the Colorado,” he tells how the Colorado River has been shaped by the Colorado Compact of 1922, how it overestimated the river’s annual flow and, thus, the amount of water to be shared by seven states. “The entire premise of the water supply for 40 million Americans amounts to wishful thinking,” Lustgarten said. That point is also frequently made by filmmaker and photographer Peter McBride, who grew up in the Roaring Fork River Valley and since 2009 has been telling vivid stories about the challenges facing the Colorado River and its dried-up delta. During a following panel discussion on drought, he said the Colorado River consistently is last in line for its own water. “Who is going to shoulder the deficit?” he asked. “Is it going to be ag? Are municipalities going to become more efficient? Or is it going to be the river? Often, in more cases than not, the river loses. Lustgarten and other panelists at the Ideas Fest pointed out that the primary competing interests for Colorado River water are agriculture, cities and what’s left of the river’s ecosystem. Buzz Thompson, a professor of natural resources law at Stanford University, made a similar point about the West’s “first-in-time, first-in-right” system of water law during Monday’s panel on drought. Both of the water panels at the Ideas Fest discussed the lack of transparency and accountability when it comes to the ownership and use of water in Western states. Patricia Mulroy, who ran the Southern Nevada Water Authority from 1993 to 2014 and is now at the Brookings Institution, sat on Monday’s panel and said the last 20 years have brought about an evolution in water policy. She said the big players in the broader Colorado River community are now working together to preserve the existing water supply system in the face of drought, climate change and a growing population. But Thompson warned that too often conservation gains are then used to provide water for new development. “Frequently, we are using that conversation to permit expanded growth,” he said. “And, so then, what happens is that the next time we have a drought, we’ve already used up that conservation and it becomes even more difficult to withstand that particular drought. Aspen Journalism, the Post Independent and The Aspen Times are collaborating on coverage of rivers and water. More at http://www.aspenjournalism.org.